Chess is originated in Indian subcontinent in the 6th century in Gupta Empire. It was early known as Chaturanga and Chatrang. Chatrang became Shatranj when Muslims came in this area during 7th century. The game reached in Russia and Europe in the 9th century. European gave it the name of Chess. 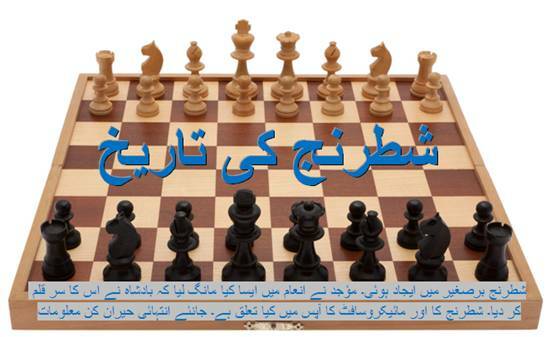 Rules of the Chess was changed and developed various times, until now it has reached its current shape and rules. In the past, chess was a part of noble culture and known as kings’ game. It was used to teach war strategy to princes and commanders. It is like two armies each lead by a King. Here is also a very interesting story which is believed to be about the invention of Chess. This game was developed by a mathematician of that time. He presented this game to the king. The King liked this game so much that he offered to the developer anything he wished for. Developer replied that he would like one grain of rice for the first square of the board, two grains for the second, four grains for the third and so on doubled for each of the 64 squares of the game board". The king was astonished that why this poor man not asked for gold or silver coins? The King ordered to fulfill the request of the developer but soon it was revealed that it is not easy to fill these squares with rice grains as per the developer’s condition. In fact the whole empire supply of rice was bushed before the 30th square was reached. It is actually impossible to fill all the squares of the chess board with rice grains with this formula. Land never produced this much rice in a single time. Can you guess how many rice grains (in numbers) and how much rice (in weight) would be the exact answer? Now a days, Chess is not only a game but it is also related to several branches of mathematics. It also provided basics of computer science. Do you ever think why a byte is equal to 8 bits and not to 10 bits, why a kilobyte is equal to 1024 bytes and not to 1000 bytes? Because it is based upon the structure of chess game, there are 8 squares in a line, and a total 8 lines. So the number of bytes in computer science also moved in 8s; 8, 16, 32, 64, 128, 256, 512 and 1024.